I’ve added a Tomcat Negotiate (Kerberos + NTLM) authenticator to Waffle 1.3 for Tomcat 6. Here’s how to use it. Download Waffle 1.3. The zip contains Waffle.chm that has the latest version of this tutorial. 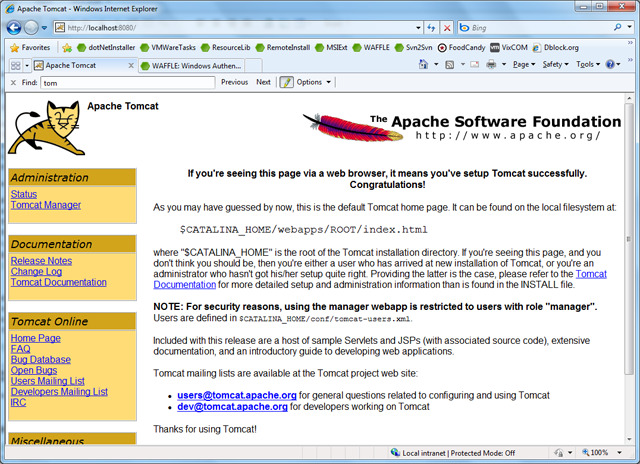 I started with a default installation of Tomcat 6. Checked that I could start the server and navigate to http://localhost:8080. Copy the following files into tomcat’s lib directory. Add a valve and a realm to the application context in your context.xml (for an application) or in server.xml (for the entire Tomcat installation). Configure security roles in your application’s web.xml. The Waffle authenticator adds all user’s security groups (including nested and domain groups) as roles during authentication. Restrict access to website resources. For example, to restrict the entire website to locally authenticated users add the following in web.xml. Restart Tomcat and navigate to http://localhost:8080. You should be prompted for a logon with a popup. This is because by default localhost is not in the _Intranet Zone _and the server returned a 401 Unauthorized. Internet servers with a fully qualified named are detected automatically. Ensure that Integrated Windows Authentication is enabled. Choose the_ Tools, Internet Options_ menu. Check Enable Integrated Windows Authentication. The target website must be in the Intranet Zone. Choose the Tools, Internet Options menu. Check Autmatically detect intranet network. Add http://localhost to the list. Type network.negotiate-auth.trusted-uris in the Filter box. Put your server name as the value. If you have more than one server, you can enter them all as a comma separated list. Navigate to http://localhost:8080 after adding it to the Intranet Zone. You should no longer be prompted and automatically authenticated. In the logs you will see the following output for a successful logon. My laptop is not a member of an Active Directory domain, but you would see domain groups, including nested ones here. There’s nothing special to do for Active Directory. The authenticator also automatically handles all aspects of the Negotiate protocol, chooses Kerberos vs. NTLM and supports NTLM POST. It basically has the same effect in Tomcat as choosing Integrated Windows authentication options in IIS. Tomcat SPNEGO by Dominique Guerrin: this is a very good prototype of a filter. It uses JNI and not JNA, doesn’t support NTLM POST and the code is pretty thick. Single Sign-On: Tomcat Negotiate Authenticator (Kerberos + NTLM) w/ Waffle was published on May 20, 2010 . See a typo?